Superman now repowered is side by side with Wonder Woman, Batman, Steel & Stargirl fighting the new comet charged spawn of Savage. Soon, Adam Strange, Flash, Green Lantern and more join the fray and the two sides battle it out to gain the upper hand. Vandal removes the metal rod impaling him to the ground and senses the comet calling to him. Ukur attacks him while he is distracted but Vandal bests him and stabs him through the back. The Puzzler bot appears and straps his father up with a rocket pack allowing Savage to rise high enough to the comet until it gives him the power of flight. Superman tries to explain to Salvaxe that Savage is gifting all his children with powers from the comet to monitor the side effects but he is unwilling to listen, next Frankenstein attacks but Superman is ready for the black fluid and rips it off with his bare hands. He urges Frankenstein to fight on the side of the heroes once the effects subside and soars skyward to intercept Savage. Meanwhile Wonder Woman and the remaining heroes notice a sudden change in the children of Savage. The power of the comet was never meant to be shared and the children all begin to fall apart and explode. Superman finally catches up to Vandal but it's too late, the comet is almost literally upon them. Story - 2: What a disappointment... Superman is back! Well, powered up after an overlong convoluted story that is heading for a finale and this is what we get... I should be ecstatic and I appreciate that the pace has to be faster as we head for the big pay off but there is literally no story here. For example Wonder Woman appears on just seven pages and speaks only four times. It was good to see Superman fighting the good fight however, still trying to reach out to Salvaxe and Frankenstein but even then the man of steel really has minimal story to work with. I know many readers are still reeling from the whole 'spare key to the Fortress could have saved us the disappointment of Truth' but this issue has another nonsensical development. Vandal Savage gifted all his children superpowers, then supercharged them with the comet... only for them to die... to what end? For a distraction? Draining the comets power to siphon into multiple 'victims' seems like valuably wasted energy that he is desperate to have. Like the Fortress suddenly opening this seems... odd and unexplained or poorly so. I just wanted more meat to the story than we got, this just feels like filler and considering the high calibre of writing from Tomasi recently it comes as a complete shock. Bring on the end. Art - 3: Truth is epic, so we're told. The art doesn't sell that feeling. I don't feel Superman's 'return,' I don't sense that urgency of the heroes fighting for their lives, the power involved, the impact of the battle. It all seems very bland. Even the splash pages seem sparse and the coloring a little like washed out pastel. The writing is trying to speed up events and give a lot of freedom for the art to sell the action, violence and that 'epic' feel but it just isn't there. I don't think it's the artists fault there just isn't enough here to work with, nor to justify an issue. The finale page doesn't look shocking, scary or awe inspiring... it looks a little like it was from a Looney Tunes toon. Perhaps with some heavier inking and louder color palette the feel would have been different? 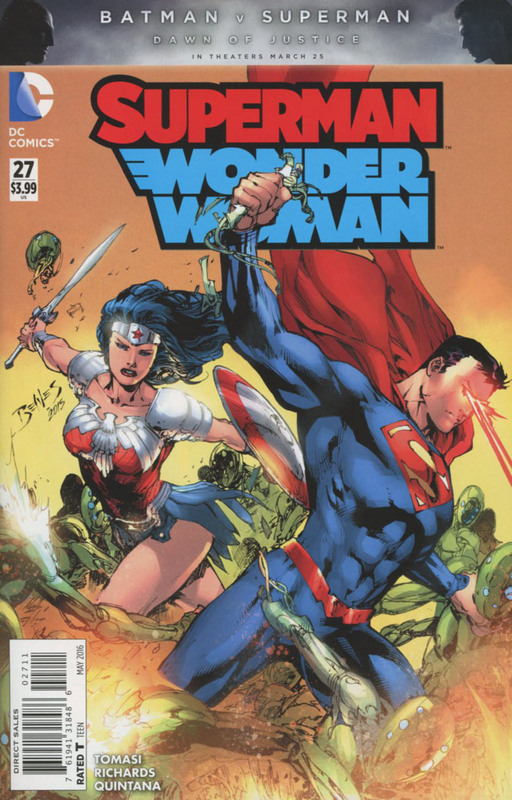 Cover Art - 4: It is nice to see Clark and Diana fighting side by side, a return to greatness as it were. Benes delivers a great cover that reminds us what has been missing from the books. I wish there was a little more emotion in their faces but that's a minor quibble considering how nice it was to see them as a power couple once more. Reminding us the love is indeed a battlefield. 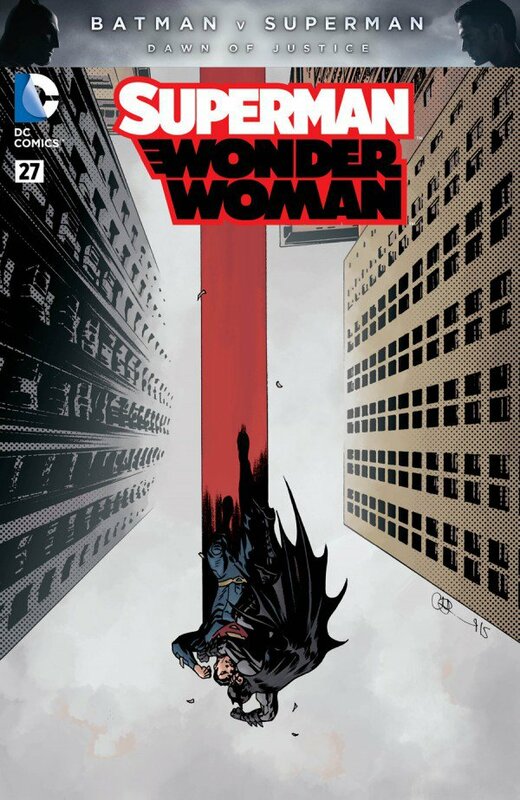 "Batman v Superman" Variant Cover Art - 4: A dark and broody cover represented by three colored layers. Artistically it is a nice creative cover with an interesting angle with a point of view we rarely see. I really like the style and the visual they are going for.